Product #60781 | SKU 996368005 | 0.0 (no ratings yet) Thanks for your rating! 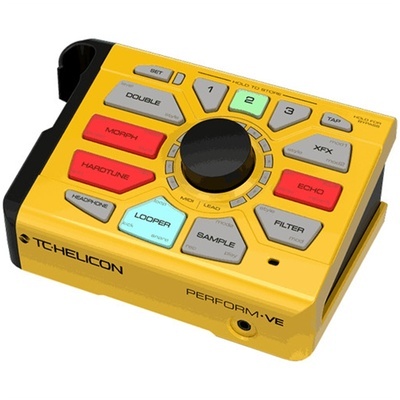 Designed for creative singers and singer/songwriters, the TC-Helicon PERFORM-VOE is a vocal processor that sits on your mic stand. It combines creative tonal effects, looping, and a methodology TC-Helicon calls Vocal Sample Synthesis to automatically keymap samples of your own voice to any compatible keyboard. With the PERFORM-VOE, you can create octavized harmonies, tune your vocals (subtly or in the manner of T-Pain—the choice is yours), slap on ring modulation, slice up phrases with stutter, and apply ambiance, all through large, clearly marked buttons. Many of these buttons house more than one parameter; lean your finger to different corners of the button, and you'll be able to tweak a variety of different controls. With the MORPH button, you can shift the apparent gender of your voice and more, while the subtler Adaptive Tone circuit automatically applies musical compression, gating, de-essing, and AEQ to your signal. A clearly visible, four-colour light ring helps makes editing timbres on the fly a simple affair, and once you’Voe tailored the sound to your liking you can recall it any time with dedicated buttons for that express purpose. The large LOOPER button lets you create repeating soundbeds, and what's more, gives you the ability to layer in kicks and snares, thereby adding a percussive backbone to your loops. Hooked into a keyboard with the appropriate routing setup, you can record vocals straight to the machine and then replay them with your fingers on the keyboard, creating the kind of synthesised vocal pads typified by artists such as Imogen Heap or Bon Iver—though it’s just as easy to make your own individualised mark as well. All the built-in effects, in all their tweakable convenience, ensure an eminently customisable tone. The unit provides up to eight MIDI-controllable synth voices, while also giving you a ninth lead voice that can play in unison with your vocal in real time, giving it more of an electronic bent. Since the PERFORM-VOE can receive MIDI tempo from external devices, you’ll always be in sync with your host sequencer. Finally, the unit functions as a multichannel USB interface, letting you record audio, or play prerecorded audio from your own studio setup.